Yesterday, Nintendo announced they were discontinuing production of the NES Classic within North America. With demand high, I was curious to see how things were playing out on eBay. Turns out, it’s a lot like when Michael Jackson died. Slightly baffled by Nintendo’s business decision, I took a look at how the NES Classic’s value shifted among collectors and resellers in reaction to the news. This meant digging through eBay. My initial interest wasn’t in the overall price increase. I wanted to see the most absurd auctions. Plenty of people are eager to own an NES Classic. That meant opportunists were sure to sweep in and angle for a few suckers willing to blow untold sums on a hyped-up emulator. Holy crap, look at that! Now, these aren’t necessarily “real” postings. They’re mostly there to seize upon hysteria, test the waters, and see if Daddy Morebucks decides he really needs a new console. With a little more digging, it turned out that the highest price for which a unit actually sold was closer to $400. People were willing to pay as much for a NES Classic as a Nintendo Switch. To get a better sense of the data, I turned to JJ Hendricks over at PriceCharting, a website that scrapes eBay and tracks historical prices. Data on new sales showed that listings for the NES Classic averaged at $143.73 in March. For April, the average is $352.20. It starts to paint a picture, albeit one that falls within the expected range. When supply goes down and demand remains the same, the price will increase. Plenty of people want an NES Classic, particularly now that they have the added allure of exclusivity, which can send demand higher. People want stuff when there’s less stuff to share? People pay more. I vaguely remember all of this from high school. With more specific data, we can actually form a narrative. 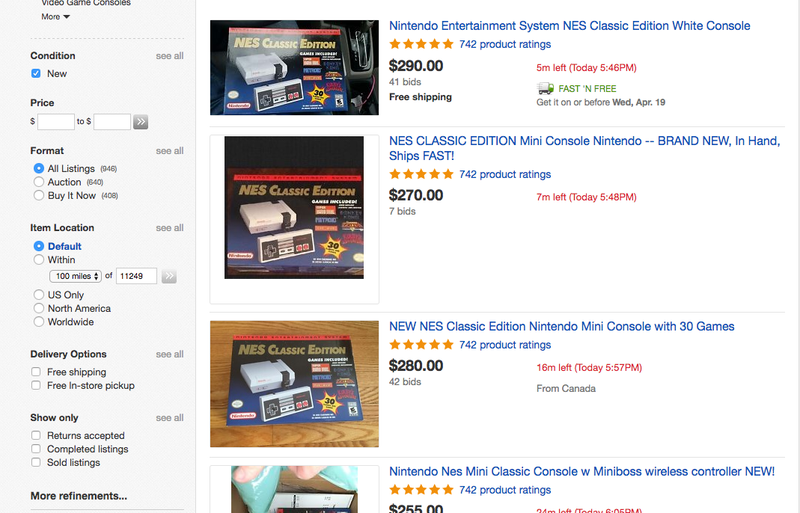 A day before the announcement, NES Classics were selling for an average of $106. That’s alright considering the retail price was $59.99 and demand was already high. In fact, that price that was slowly decreasing as the holiday season moved firmly into the rear view mirror. That price remains the same on the following morning before slightly increasing. Then the discontinuation news breaks. You’d think that this is the moment where prices take a jump. I definitely expected that to be the case, but the data shows that the announcement had more of a ripple effect. The average price actually rested at $220 by the end of the day. When the news hits, people scooped up the lower listings that were made before the announcement. As the demand becomes clearer, prices leapt. That bring us to today. The average this afternoon rests at $335. It’s about 52% increase from the previous day and a 219% increase from where prices were on Wednesday. That value increases only slightly if you’re purchasing a modified console with more games. I looked at the average of every modded console I could find a listing for. Ignoring that selling unauthorized copies of games is a violation of eBay’s terms of service and also illegal, the average price on listings was $345.50. Some listings are really low, some are really high, but they cancel each other out and hardly increased the price overall compared to a vanilla console. It turns out, Hendricks says, that the pattern of the data is similar to another case: the increase of sales price for Sega Genesis cult classic Moonwalker after Michael Jackson’s death in 2009. There’s a detailed breakdown at PriceCharting, but the gradual increase in price is a shared theme. Prices only increased slightly on the day of Jackson’s death before increasing by 497.40% the day after. It’s a bit more drastic than the NES Classic’s rise, but they share the same “delayed ripple” effect. Moonwalker prices lowered over the next few days. Instead of the the high price of $131, it settled at a little over $60. There’s going to be demand for the NES Classic for a while and prices will fluctuate up and down. If Nintendo doesn’t introduce a substitute product, we may see an even bigger increase come Christmas. If you still feel you’ve absolutely got to have one and you miss out on the final shipment this month, the best course of action might actually be to bide your time like a super-villain and wait for the right moment to strike.